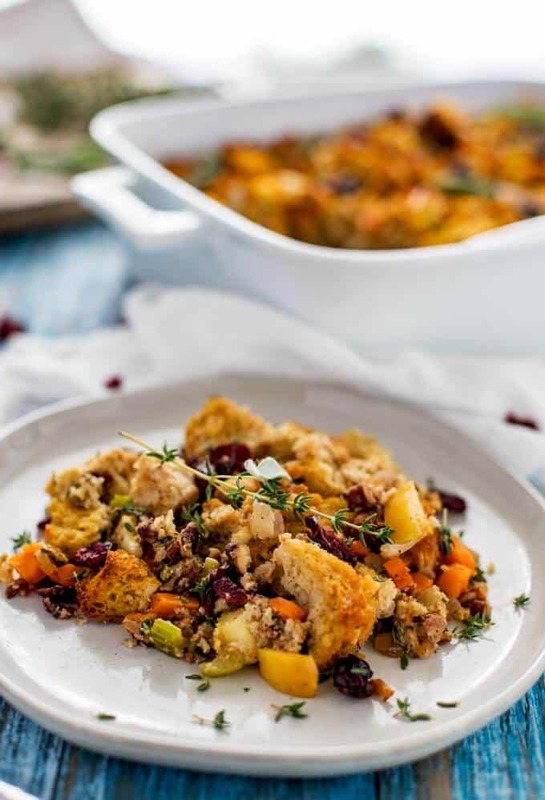 This Gluten Free Stuffing recipe is the perfect dish for Thanksgiving or Christmas! Best of all, no one will mind that it is gluten-free. It tastes just like the “real thing”! There are some things that the holidays just wouldn’t be the same without. Stuffing is one of them, don’t you agree? When I first went gluten-free, I thought that it meant that I would have to give up dressing. I mean, there was no way I was going to convince the rest of the family that my gluten-free version was as good as the “real thing”. And with the holiday already being 50 Shades of Crazy around my house, there was no way that I was making a separate dish just for myself. Since that time, I’ve learned that with a little effort, you can make almost everything gluten-free delicious enough that the whole family will enjoy it. And that includes this Gluten Free Stuffing. You guys, it is yummy! The good news is that even if you are entertaining enough people that two stuffings are required, this one is fairly easy to make. 1.1 Is there Gluten in Stuffing? 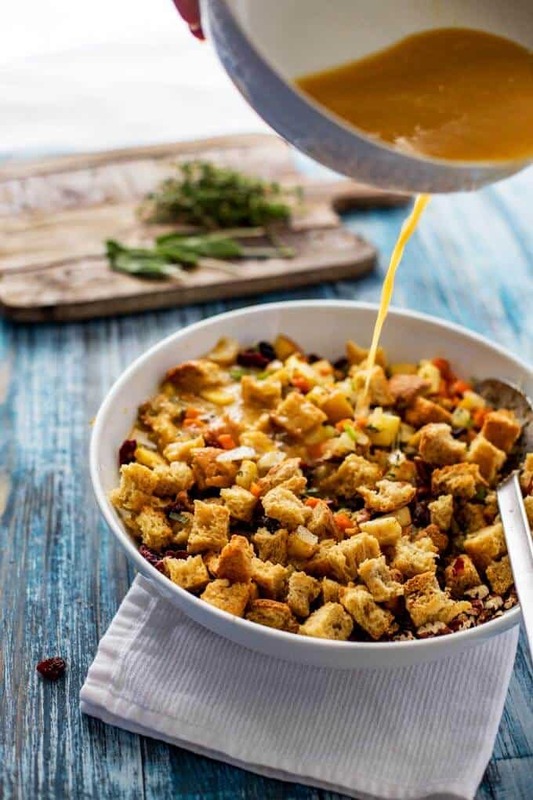 2 How Do You Make Gluten-Free Stuffing? 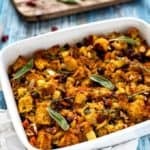 Is there Gluten in Stuffing? 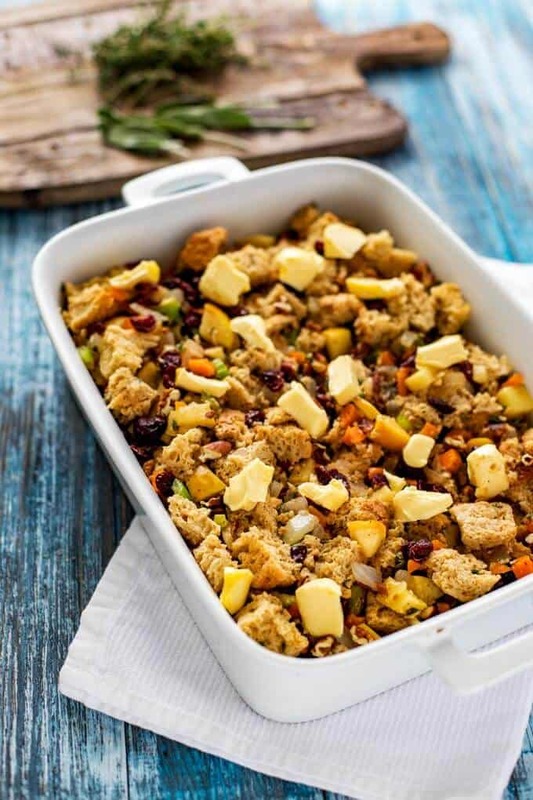 Yes, most stuffings and stuffing mixes contain gluten. You can find a boxed version, but make sure you read the labels carefully. 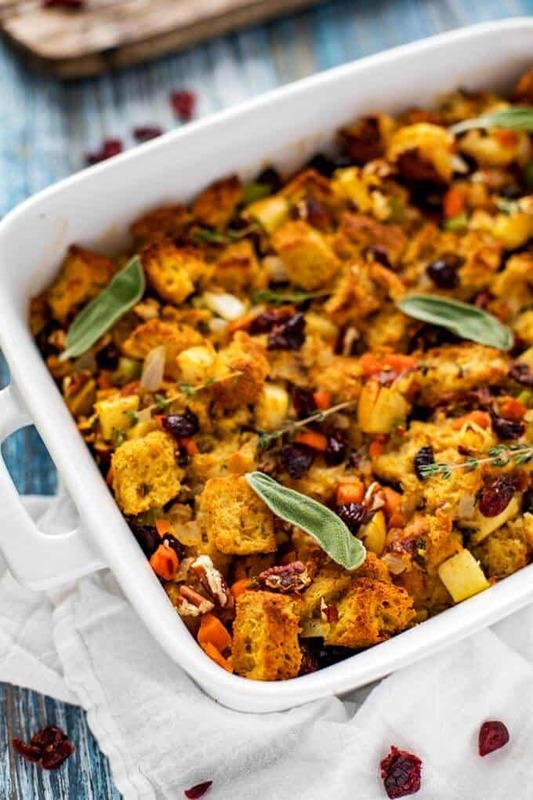 How Do You Make Gluten-Free Stuffing? The first thing that you want to do is toasted the bread. Preheat your oven to 275 and line a large baking sheet with parchment paper. While the oven is preheating, cut the bread into cubes. Bake for 30 to 35 minutes, or until the bread is dry to the touch. Next, you want to chop your onions, carrots, celery and apple. Now is a great time to go ahead and chop your herbs as well. 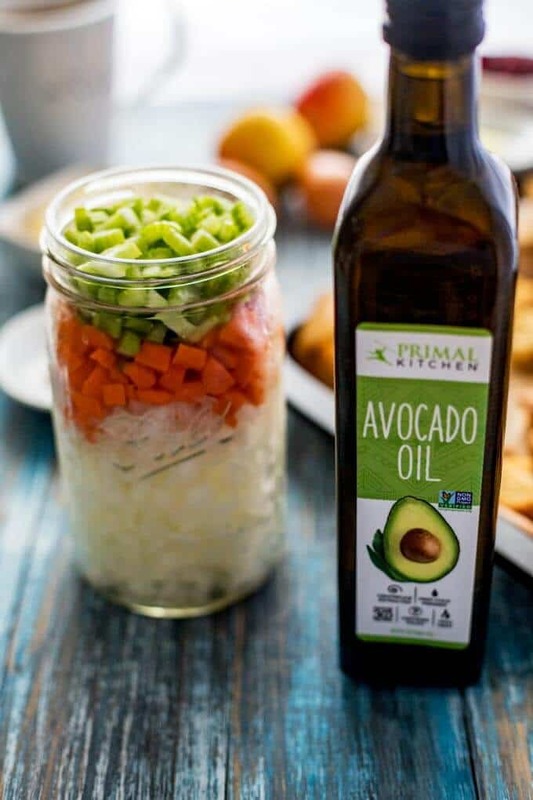 Heat avocado oil in a large skillet over medium heat. Add the onion, carrots, and celery. Cook, stirring often, for 10 minutes. Add the apple, and continue to cook for about 4 minutes. Add the garlic to the pan, and cook for one more minutes. 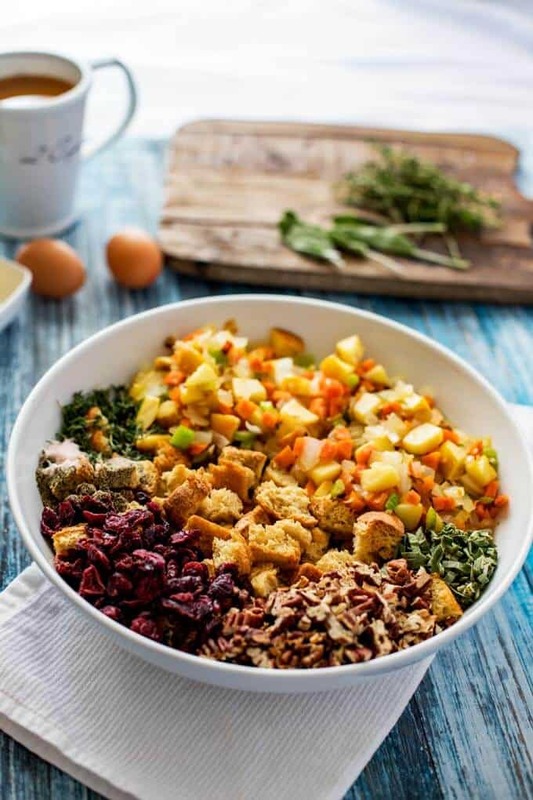 Transfer the fruit and vegetable mixture to a large bowl. Stir in pecans, dried cranberries, thyme, sage, salt and pepper. 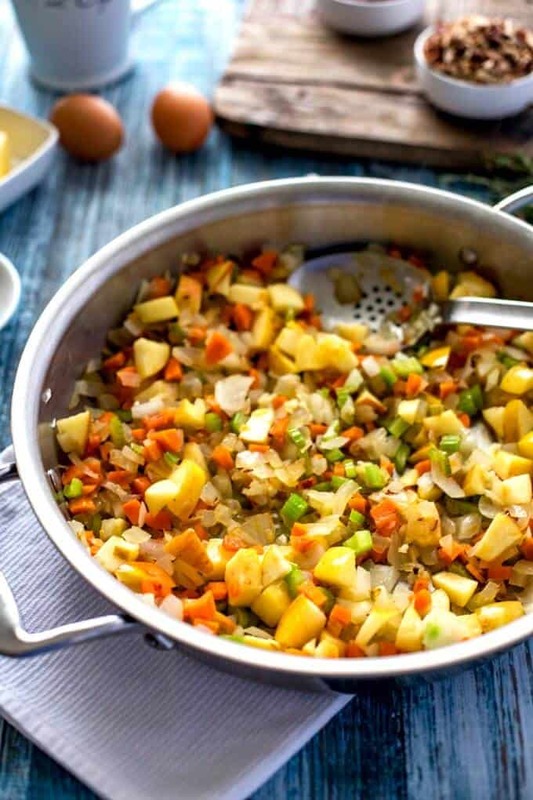 In a medium bowl, whisk together the eggs and broth. Pour over the bread mixture. Season with salt and pepper, and add additional broth as needed to ensure that the bread is hydrated. Spray a baking dish with oil, and transfer the bread mixture to it. Cut butter into small pieces, and dot over the bread mixture. Spray a piece of parchment paper with oil, and place on top of the dish. Cover with foil. Bake for about 25 minutes! Enjoy! 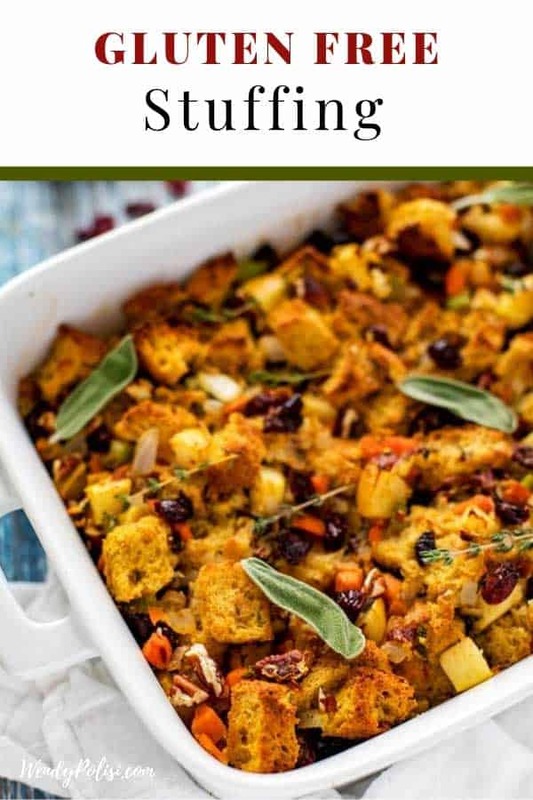 Think Gluten Free Stuffing means sacrifice? Think again! 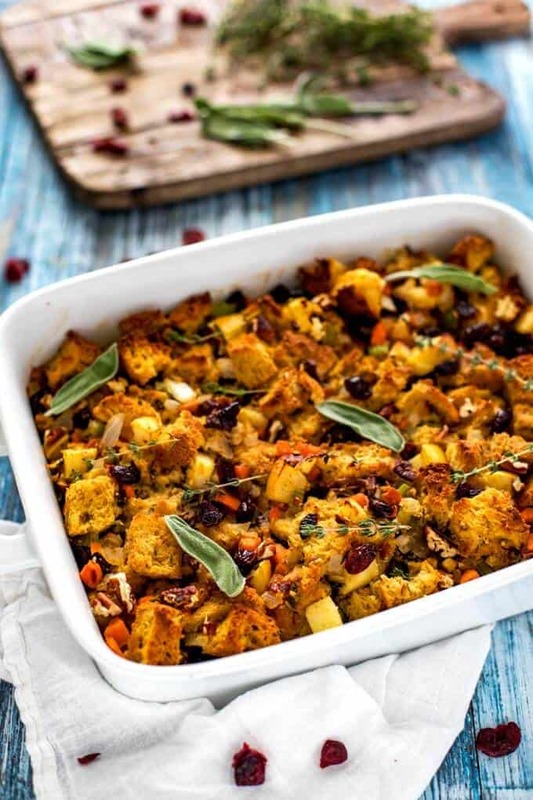 This stuffing recipe is flavor packed and one the whole crowd will love - gluten free or not! Preheat oven to 275. Coat a 13 x 9 baking dish with oil. Line a large rimmed baking sheet with parchment paper. 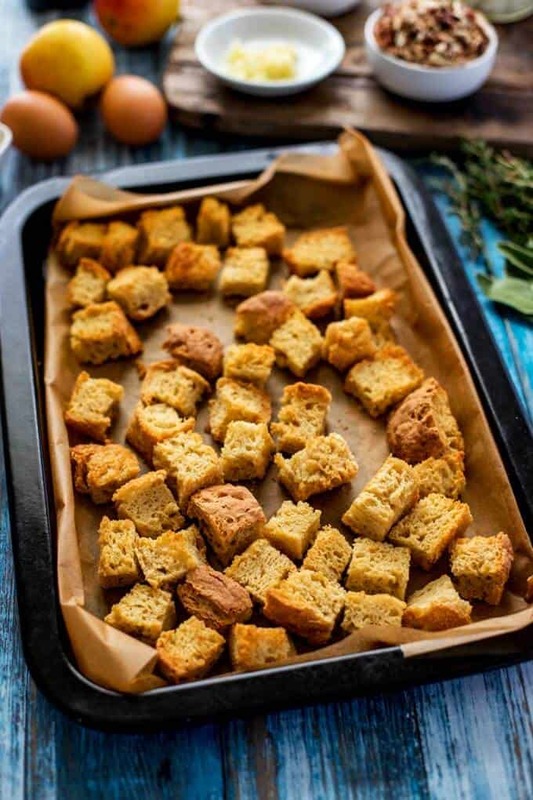 Place bread cubes on rimmed baking sheet. Bake until dry to the touch, about 30 to 35 minutes. Let cool and transfer to a large bowl. Increase oven temperature to 350. Meanwhile, heat avocado oil in a large skillet over medium heat. Add onion, carrots and celery. Cook, stirring often, for 10 minutes. Add apple and cook for 4 minutes. Add garlic and cook 1 more minute. Transfer mixture to the bowl with bread and stir in pecans, dried cranberries, thyme, sage, salt and pepper. Whisk together eggs and broth in a medium bowl. Stir over the bread mixture, seasoning with additional salt and pepper to taste. Add additional broth, as need to ensure the bread is hyrdrated. Cut butter into small pieces and dot over the bread mixture. Spray parchment paper with oil and place on top of dish. Cover with foil. Bread may be dried in the oven up to 3 days ahead of time. Allow to cool completely and store in a zip top bag. Use 3 Granny Smith apples, 1 cup diced roasted chestnuts, 1/2 cups dried cranberries, 1 tablespoon chopped fresh sage, and 1 tablespoon chopped fresh thyme. Add in 1 pound ground turkey sausage for a more hearty dish. Mix in 1 1/2 cups of Wild Rice and 1 pound sautéed diced mushrooms.